- wire (for legs, handles and horns). Please note that Barash is knitted from yarn, which is slightly thinner than the yarn used to create other smeshariki. To knit 4 unfinished columns with 2 nakida in one loop of the previous row, then join these columns, tying all the loops on the hook together. Please note that in the example "Sishechka" consists of 5 bars, and in the description of 4. 1 row: dial lilac thread 2 v. and close the ring. Knit 6 tbsp. b / n [= 6 tbsp. b / n] Next, knit in a circle. 9 row: * 1 tbsp. b / n, "Shishechka" *. Repeat * 7 times. Next, knit 11 tbsp. b / n and repeat * another 11 times, 1 tbsp. b / n [= 48 cent.]. 11th row: * "Shishechka", 1 tbsp. b / n *. Repeat * 7 times. Next, knit 12 tbsp. b / n and repeat * another 11 times [= 48 cent.]. 13 row: * "Sishechka", 1 tbsp. b / n *. Repeat * 6 times. Next, knit 12 tbsp. b / n and repeat * another 12 times [= 48 cent.]. 15 row: * "Shishechka", 1 tbsp. b / n *. Repeat * 5 times. Next, knit 12 tbsp. b / n and repeat * another 13 times [= 48 cent.]. 16 row (+ 2 st b / n to offset the beginning of the row): knit 48 st. b / n and 2 tbsp. b / n to shift the beginning of the series to the left. 17 row: * 1 tbsp. b / n, "Shishechka", 1 tbsp. b / n, "Shishechka", 1 tbsp. b / n, "Shishechka", 1 tbsp. b / n, skip 1 tbsp. b / n previous row *. Next, knit 7 tbsp. b / n, skip 1 tbsp. b / n of the previous row and repeat * 4 more times [= 42 cent.]. 20 row: * 4 tbsp. b / n, skip 1 tbsp. b / n previous row *. Repeat * 6 times [= 24 Art. b / n]. Stuff torso filler. 22 row: * 2 tbsp. b / n, skip 1 tbsp. b / n previous row *. Repeat * 6 times [= 12 Art. b / n]. If necessary, add more filler. 23 row: * 1 tbsp. b / n, skip 1 tbsp. b / n previous row *. Repeat * 3 times [= 3 tbsp. b / n]. Tie the remaining 3 loops together, tear the thread. At the top of Barash left an empty space on which it is necessary to fasten the thread and tie another “Knobs”. 1 row: dial purple thread 2 v. and close the ring. Knit 6 tbsp. b / n [= 6 tbsp. b / n] Next, knit in a circle. 30 row: 2 tbsp. b / n., 2 semi-columns with / n, 3 tbsp. s / n, 2 semi-columns s / n, 1 tbsp. b / n, 1 connecting column. Thus, one edge of the part will be longer than the other. Cut the wire the size of 12-14 cm, bend one edge at it, wrap with a small amount of filler (according to the thickness of the horns). Drag the filler with the thread and insert the wire with the curved end into the horns. Fold the horns into a spiral. Unclamp the edge of the wire to stick into the upper body and sew to it. 1 row: dial with purple thread 2 inc. and close the ring. Knit 6 tbsp. b / n [= 6 tbsp. b / n] Next, knit in a circle. 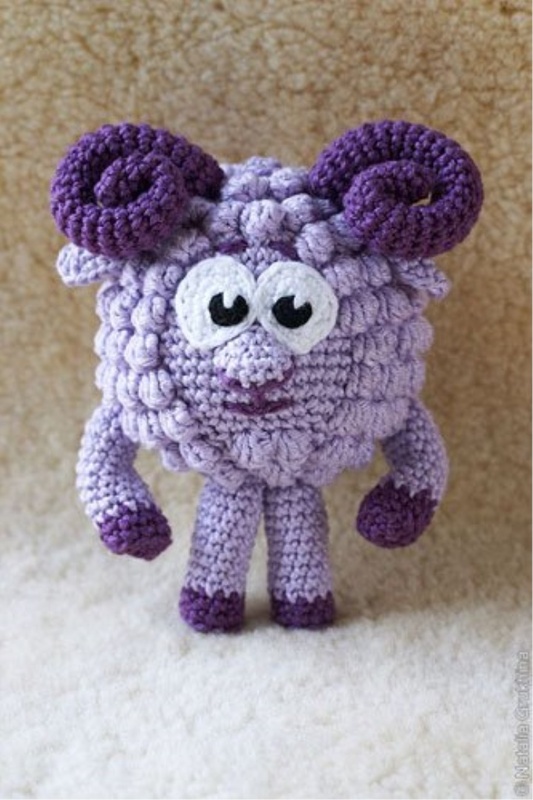 Insert wire with a length of 7-8 cm in the legs, wrapped with padding polyester (see the description of the horns). Row 1: dial purple thread 2 vp and close the ring. Knit 6 tbsp. b / n [= 6 tbsp. b / n] Next, knit in a circle. Insert a 7-8 cm long wire wrapped in padded plastic into the handle (see the description of the horn). 1 row: dial lilac thread 5 ce, knit 1 article b / n into the second loop from the hook, 2 article b / n, 3 article b / n into one loop, turn knitting clockwise, 2 article b / n 2 st.b / n in the initial loop [= 10 tbsp. b / n]. 2 row: 2 st b / n in one loop, 2 st b / n, 2 st b / n in one loop, 3 half posts with c / n in one loop, 2 st b / n in one loop, 2 st b / n , 2 items b / n in one loop, 2 items b / n in one loop, 1 connecting column [= 18 items]. Cut the thread. 1 row: dial with lilac thread 4 ect, knit 1 article b / n into the second loop from the hook, 1 article b / n, 3 article b / n into one loop, turn knitting clockwise, 1 st b / n, 1 st b / n in the initial loop [= 8 st. b / n]. 2 row: go to knitting with a purple thread and knit 1 article b / n, 2 article b / n in one loop, 1 article b / n, 2 article b / n in one loop, 1 article b / n. Next, change the thread to purple and knit 1 article b / n in the same loop, 2 article b / n in one loop, 1 article b / n, 2 article b / n in one loop, 1 article b / n in the initial loop [ = 14 UF / n]. To make the transition between colors smoother, I recommend stitching a few stitches with a purple thread. 1 row: type in white thread 4 vs and knit 1 st b / n to the second loop from the hook, 1 st b / n, 3 b / n into one loop, turn knitting clockwise, 1 st b / n, 2 st.b / n to the initial loop [ = 8 tbsp. b / n]. 2 row: 2 st b / n in one loop, 1 st b / n, 2 st b / n in one loop, 2 st b / n in one loop, 2 st b / n in one loop, 1 st b / n , 2 items b / n in one loop, 2 items b / n in one loop [= 14 items b / n]. 3 row: Knit a row with single crochets [= 14 tbsp. b / n]. Cut the thread. 1. Sew handles and legs to the body. 2. Sew horns and ears. 3. According to the picture arrange the face.